Once again, on Saturday afternoon it was time for the popular local trailrunning race, The Goshen Gallop! The good news was that this year’s relatively dry conditions would make for good footing onwhat were more typically muddy trails. The bad news was that Saturday was HOT! The temperatures were probably hovering around 80 at the start of the race, but this, combined with a lot of climbing, didn’t bode well for any personal bests from this middle-aged runner. So, I donned one of my oldest t-shirts from this race, and drove up to the Blueberry Hill Inn in Goshen. My Goshen Gallop t-shirts make up some of the oldest surviving t-shirts in my collection – I first ran this run race in 1989, when it was held in September, rather than its now customary mid-July running. My first Gallop was a memorable race – the remnants of Hurricane Hugo had just passed through the northeast, rendering the usual trail course impassably wet – given the typical mud on this race course, I can’t begin to imagine what the trail conditions must have been like! So, the race was forced to the dirt roads of Goshen. Since then, however, the race has been held on the same course on the Blueberry Hill ski trails on every year that I have run the race. The race started off heading south on the Goshen-Ripton road for about a half mile, before making a sharp left turn into the trail system. As the trail switchbacked up the side of Hogback Mt., I had the opportunity to chat with another runner named Andy, who I recognized from previous races. As it turned out, he had actually taken a chemistry course from me in my first year or second year of teaching, roughly 25 years ago. I had no memory of his enrollment in any of my courses, but he was adamant, and I know from experience that when I meet up with former students, they ALWAYS remember how they did in chemistry. The race crested the hillside of Hogback Mountain as we ran past perplexed wild blueberry pickers ( the berries were wild, the pickers probably not), and pausing for a quick sip of water at the first water station, Andy pulled ahead never to be seen again until the finish line. After the short descent to the water station, climbing resumed as the trail angled back towards the inn. About a half mile before the 5 km mark where the race returned to the inn there was a very overheated dog lying there panting alongside the trail, looking like it was in trouble. Apparently, the dog had decided to try and run the race, and had overdone it by this point. Many of the runners alerted the workers at the half way point, so we all went on assuming that the dog would be tended to. About half of the runners stopped at this point, planning on only running the 5 km race, making this an excellent introduction to the pleasures of trail racing for neophytes. The rest of us took the sharp right turn, temporarily bypassing the tempting swimming hole, and headed immediately up the steepest climb of the run. At this point, the heat was starting to get to me, so I had to do a few short sections walking, but I took comfort in the observation that I was not the only middle-the-pack runner in the same state. The trail climbed steadily to the 6 km point, where it did a series of gentle ups and downs for the next km or so, before a pleasant descent on the Steward trail until it joined a the forest service road connecting the Sugar Hill Reservoir with the Goshen-Ripton road. The race headed towards the latter destination, and finished with about a mile on this dirt road before ascending one last road climb up the the by now very welcome finish line in front of the inn. 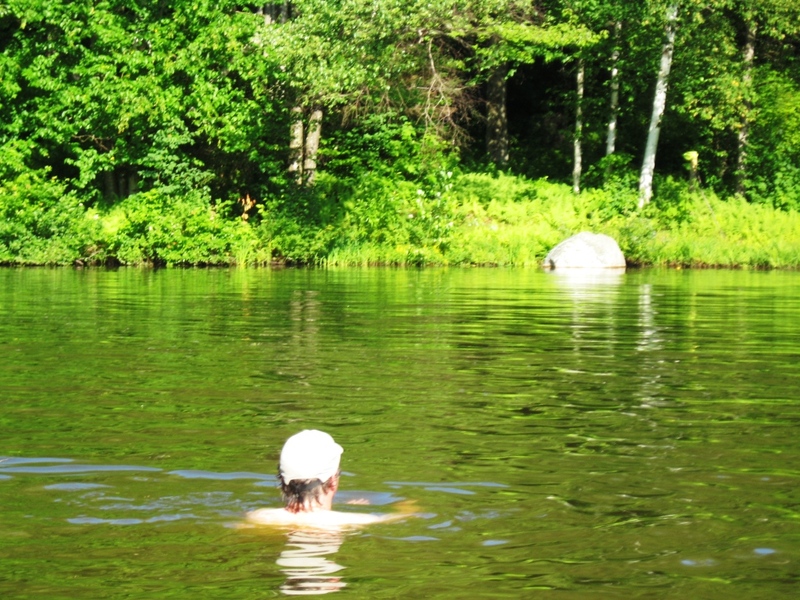 There was no personal best to be had on this day, but it was fun as always, especially after a lot of water, for drinking, as well as swimming – the aforementioned swimming hole behind the inn beckoned! I was also relieved to see that the running dog was being administered to, and was recovering. 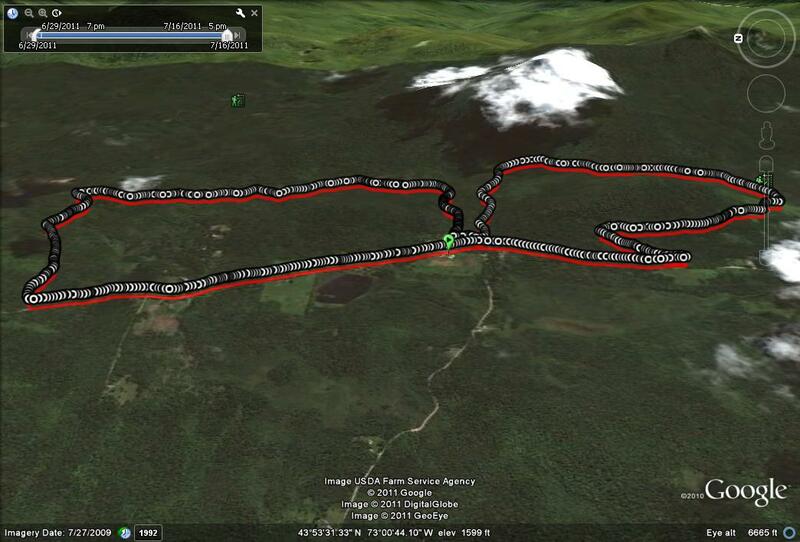 While this race was originally advertised as a 10 km race, then as a 10.2 km race, my GPS measured it at 10.6 km. This was fine, as nobody in their right mind would expect to run anywhere near their normal 10 km pace on a trail race like this, with all of its climbing, descents, and summer heat. The excellent post-race picnic meal, prepared by the inn’s kitchen finished off a great afternoon.